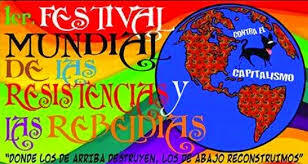 In a communique signed by Subcomandante Insurgente Moisés on 14 December, the Zapatista Army of National Liberation (EZLN) reports that it will cede its place to the relatives and disappeared students from Ayotzinapa during the First Global Festival for Resistance and Rebellion against Capitalism, to be held from 21 December to 3 January in different places in Mexico, though it clarified that it still will participate in the work. This entry was posted on Wednesday, December 17th, 2014 at 7:49 am and is filed under Chiapas, Disappeared, Guerrero, Human Rights, Human Rights Defenders, Indigenous people, Justice system, Land and Territory, Land rights, Mexico, Paramilitary, torture, Women, Youth. You can follow any responses to this entry through the RSS 2.0 feed. You can leave a response, or trackback from your own site.